Performing Sudarshana Homam shields us from detestable effect, discards bothersome components and enhance the vitality level in nature. Master Sudarshanar is the considered as one of the skilled indications of Lord Vishnu and you can see Lord Vishnu holding the Sudarshana Chakra on his correct hand which is a strongly effective weapon. 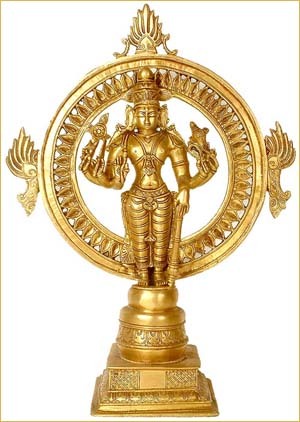 He is generally called Chakarath Aalwar in Tamil. This homam is strongly effective and it shields one from their adversaries and demolishes abhorrent drishti thusly giving assistance from each one of your issues. This homam is performed conjuring Lord Sudarshanar took after by the droning of Lord Sudarshana Mantra. When to Perform Sudarsana Homam? The date can be settled by one's nakshatra, the yoga, and thithi of that specific date. Saturdays, Ekadasi, and Pournami are proved to beneficial to advantageous for performing Sudarsana homam. All the Pooja Samargi will be brought by Pandit. All the Iyer are very much experienced and studied from Vedic Pathshala. Book your Pandit/Iyer Online for Sudarsana Homam.